Today Prince Charles as a descendant of James IV King of Scots holds the title of Lord of the Isles however in the past the MacDonalds held this title. They were forced by James IV to give up the Isles to the crown in 1505. 1. Donald I Mor (Domnall) 1st Lord of the Isles (died 1249) a grandson of Somerled (Shlomo) the Khazar Prince of r1a ydna who became King of the Isles married Mariota the daughter of Walter Stewart. Donald inherited his father's lands of Kintyre and Islay in 1210. His father had been a devout Jew who had favoured the Church in his realm but Donald rebelled and followed the ways of his Khazar warrior ancestors by pillaging Derry in 1212 and he was involved with many uprising with and against his relatives. Around 1230 his cousin Dugald Screech attacked his Kingdom and seized it. He fled to the court and protection of King Alexander II of Scots and he had a strong religious conversion under the influence of his devout wife Mariota a daughter of Walter Stewart the 3rd High Steward of Scotland and his wife Bethoc a granddaughter of Henry, Earl of Huntingdon. He went on pilgrimage to Rome and Jerusalem (which was at this time restored to the crusaders (1243)) and managed on his return to take back his Kingdom in Islay and Kintyre by about 1245. He was succeeded to his now peaceful Kingdom by his older son Alexander. 2. Alexander I Mor (Alisdair) 2nd Lord of the Isles (b. 1232 r.1249-1256) a son of Donald I the 1st Lord of the Isles married Juliana daughter of Ewen Lord of Argyle. Alexander I Mor maintained loyalty to the new Scottish King Alexander III of Scots when Alexander II died in 1249. His younger brother Angus joined his cousins Ewen and Dugald in opposing the Scottish King Alexander II after the death of Donald I Lord of the Isles. His cousin Ewen became reconciled with King Alexander III around 1255 and King Alexander III confirmed him as Earl of Argyle. At this time Ewen's devout Jewish daughter Juliana married Alexander I Mor Lord of the Isles. Alexander's younger brother Angus of Islay succeeded him as King or Lord of the Isles. 3. Angus I Mor 3rd Lord of the Isles (b.1235 r.1256-1296) a younger brother of Alexander I the 2nd Lord of the Isles. Angus was made the ruler of Islay by his brother Alexander I Lord of the Isles around 1254. He inherited the Kingdom of the Isles in 1256 on his brothers death. He married his brother's widow Juliana (according to Jewish law). He is often confused with his son of the same name. In 1263 his son was held hostage by Haakon IV of Norway to ensure his loyalty. King Alexander III of Scots came north and defeated Haakon in 1264. In 1266 the overlordship of the Isles (Hebrides) passed from the King of Norway to the King of Scots. King Alexander III confirmed Angus as the King of the Isles under his overlordship in the Treaty of Perth. In 1285 he took Rebecca the mistress of Prince Alexander and her three small children by the Prince into his care and married her as his much younger second wife. He was succeeded by his son Alexander by Juliana. 4. Alexander II Og (Alisdair Og) 4th Lord of the Isles (r.1296-1299) a son of Angus I the 3rd Lord of the Isles by his first wife Juliana. He married Mariota the daughter of Prince Alexander of Scots and his mistress Rebecca of Flanders. Alexander became the Lord of the Isles at the time when John Balliol abdicated and Scotland was to be thrust into a War of Scottish Independence from England. He remained loyal to King John Balliol and to the English King Edward I Ironside. His younger half-brother Angus and the rest of Clan Donald were opposed to his loyalty to the English King and a war ensured against Alexander and in a battle in 1299 he was killed. He was succeeded by his half-brother Angus. 5. Angus II Og MacDonald (b.1286 r.1299-1320) 5th Lord of the Isles a son of Angus I Mor 3rd Lord of the Isles by his second wife Rebecca of Flanders. He married Agnes (Agatha) of the Isles. Angus II was elected head of Clan Donald after his half-brothers death and he was thus the Lord of the Isles. He was a supporter of Robert the Bruce and gave him refuge in 1306 when he was fleeing the English army. After Robert the Bruce became King he confirmed Angus as Lord of the Isles. He was succeeded by his nephew Angus III Og the son of his half brother John Alexander. Angus II and John Alexander shared the same mother Rebecca the Jewish mistress of Prince Alexander of Scots. Rebecca came with her half-sister Princess Margaret (of Flanders) to Scotland (both daughters of Guy de Dampierre). 6. Angus III Og MacAlexander (born 1300 r.1320-1330) 6th Lord of the Isles a son-in-law of Alexander II Og 4th Lord of the Isles. He was the son of John Alexander (illegitimate son of Prince Alexander of Scots and Rebecca of Flanders) and Lady Margaret Bruce (sister of King Robert the Bruce). Angus Og's son Ian Fraoch (by his mistress according to some) was the proven ancestor of the Glencoe MacDonald's of R1b y-dna. 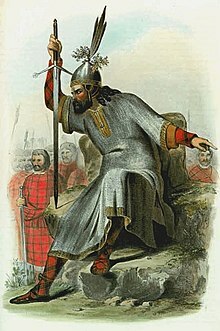 Angus III succeeded his half-uncle Angus II as Angus II's son John was still young and Clan Donald wished to please the new King Robert the Bruce who was an uncle to Angus. Angus III carried the male bloodline (on the wrong side of the blanket) from the old Kings of Scotland of the Athol-Dunkeld Dynasty. Angus had a brother called Gilbert de Insula (of the Isles) who was granted land at Menstrie in 1330. Angus died at the age of about 30 and was suceeded by his cousin John the son of Angus II McDonald Lord of the Isles. 7. John I MacDonald (Ian/ Eoin) of Islay 7th Lord of the Isles (r.1330-1345) a son of Angus II Og 5th Lord of the Isles (ancestor of those of the MacDonald Clan McAlistair of r1a ydna) [first husband of Amie MacRory and father of her children]. He is the ancestor of Clan Ranald. John was given even more territory to govern by David II but he was fickle in his loyalty switching back and forth between King David II and Edward Balliol. He then became a supporter of Robert Stewart (who eventually became the first Stewart/ Stuart King of Scotland as Robert II). He married Amie Ruiari (Mac Rory) the heiress of Clan Ruiari. He was succeeded by his cousin John II MacAlexander. 8. John II Alexander (r.1345-1387) 8th Lord of the Isles a son of Angus III Og MacAlexander 6th Lord of the Isles (ancestor of those of the Macdonald Clan of MacAlistair of R1b-M222+ ydna) [second husband of Amie MacRory Lady of the Isles] who married secondly Princess Margaret Stewart (daughter of Robert II). From John II and Princess Margaret are the R1b M222+ MacAlistairs. Ian Fraoch and this John or Iain Alexander may be the same person. John II Alexander continued his cousin's support of Robert Stewart. He also married his cousin's widow Amie and became the step-father to her children. In 1366 when King David II tried to raise a tax for his ransom, John rebelled and held out the longest. In a Treaty in 1369 John was reconciled to King David. King Robert II however decided to divide and conquer by granting certain parts of the Kingdom of the Isles to be inherited by the step-children of John (the children of his first wife Amie by his cousin John I McDonald) and the rest to John's own children by Princess Margaret Stewart. He was succeeded by his son Donald. Donald was at war with his younger brother John Mor who was his heir (taniste). John Mor was allied with the MacCleans and the war lasted many years until in 1395 John was defeated and retreated into exile in Ireland where he served Richard II. Donald's brother Alexander of Lochaber now became Donald taniste or heir to the Lordship of the Isles and they worked together to further the power of the Lordship of the Isles. Alexander became the protector or ruler of Moray and Donald claimed the Earldom of Ross on behalf of his wife who was the heiress of Ross. Donald was to fight with Robert Stewart the Duke of Albany over Ross. 10. Alexander III MacAlexander 10th Lord of the Isles (r.1423-1440) a brother of Donald II 9th Lord of the Isles. He is the ancestor of the Alexander family of Menstrie and Stirling. Alexander as the taniste succeeded his brother Donald II as the Lord of the Isles. Historians often confuse him with his nephew Alexander IV who succeeded him. Alexander III was the Lord of the Isles and his nephew Alexander (IV) was his taniste and the Earl of Ross. They worked together against the Stewarts of Albany and were at first allied to King James I of Scots. They later after 1429 fell out with King James and went to war with him. In 1431 King James imprisoned Alexander the Earl of Ross and Alexander III fought and won the Battle of Inverlochy against the Earl of Mar with the help of Donald Balloch MacDonald the Chief of the MacDonald's of Dunnyveg. On the death of his uncle in 1440 Alexander III he succeeded to the Lordship of the Isles as well as being the Earl of Ross. Hugh of Sleat is often said to be his son but in fact Hugh (b.1452) was born after Alexander's death and was the son of his widow the dowager Lady of the Isles who remarried to Alexander MacDonald of Glengarry of the Ruari Clan. He was succeeded by his son John. 14. John IV MacDonald (b.1469 r.1490-1505) 14th Lord of the Isles a half-nephew of John III 12th Lord of the Isles and son of Hugh MacDonald of Sleat (1452-1498). In 1505 he signed a document under pressure giving the Lordship of the Isles to the Scottish Crown. He married Elizabeth Seton daughter of Sir Alexander Seton 1st Baron of Touch and Tullibody by his wife Elizabeth Erskine. Hugh of Sleat was not the son of Alexander IV Lord of Isles but of Alistair Mac Donald of Clan Ruari of Glengarry with Elizabeth Seton the widow of Alexander IV Lord of the Isles. Thus the descendants of Hugh MacDonald belong to R1a y-dna. 16. Donald III the Black (Dubh) the 16th Lord of the Isles (r.1526-1545) the son of Angus IV Og Lord of the Isles. He was imprisoned in 1490 and he only truly became Lord of the Isles in 1545. 17. Alexander V Alexander (b.1505 r.1545-1564) de jure 17th Lord of the Isles a maternal grandson of John IV MacDonald 14th Lord of the Isles. He was the son of Andrew Alexander the de jure 15th Lord of the Isles. Note: Clan Macdonald have a faulty understanding of the ydna evidence due to the confusion of the paternity of Hugh MacDonald of Sleat who was a son of Alisdair (Alexander) MacDonald of Glengarry with Elizabeth Seton the widow of Alexander IV Lord of the Isles. John III Lord of the Isles was a half brother to Hugh of Sleat through their mother. This confusion occurs with genealogists who don't know if Hugh's mother is the daughter of someone called Ruari or of Elizabeth Seton. The Ruairi (Rory) refers to Clan Ruari to which the Glengarry MacDonalds belong. With this adjustment it demonstrates that all five of the MacDonalds of R1a are descendants of Amy Ruari with her first husband John I MacDonald 7th Lord of the Isles son of Alexander (Alisdair) II Og MacDonald 4th Lord of the Isles. Amy's second husband with whom she had no children was John II MacAlexander 8th Lord of the Isles, his children by Margaret Stewart are the R1b MacDonalds and Alexanders. Red presents the R1a ydna of the McDonald-Alisdair members of Clan Donald and Clan Alisdair and Blue presents the R1b M222+ McDonald-Alexander members of the Clan. William Alexander the 1st Earl of Stirling does not belong to R1a but to R1b-M222+.